Thermal barrier coatings are applied to the surfaces than operate at high temperatures, such as combustor and gas turbines. These coatings helps protect the components from wear, erosion, and corrosion, and improve energy efficiency and life of the components. A coating layer is 100 μm to 2 mm is applied to protect the component. The layer also insulates the component from prolonged heat loads. Thermal barrier coatings allow the working fluid temperatures to operate at higher temperature than the melting point of the metal. These coatings provide thermal insulation and adhere to the surface of the components. This prevents heat corrosion and oxidation. The global thermal barrier coatings market is anticipated to expand at a significant pace. Expansion of the market is attributed to the increase the demand for these coatings from automotive and aerospace industries. The thermal barrier coatings market was valued at about US$ 15 Bn in 2017 and is projected to expand at a CAGR of 6.6% during the forecast period. Factors such as rise in demand for gas turbine and the increase in the vapor deposition technologies are boosting the requirement for thermal barrier coatings. Surge in demand for thermal barrier coatings from the automotive industry is a major driver of the market. Low heat rejection engines used in automotive require thermal barrier coatings. These coatings allow the engine to function more efficiently. Use of thermal barrier coatings as an insulation in piston cylinders increases fuel efficiency of an automotive. Thermal barrier coating provides insulation in low heat rejection engines. However, rise in prices of raw materials is restraining the ceramic coatings segment of the thermal barrier coatings market. Technological advancements and introduction of innovative and new products are likely to create opportunity in the thermal barrier coatings market during the forecast period. Major players engage in acquisitions and merges to develop and launch new products and establish new facilities. These strategies are likely to propel the thermal barrier coatings market during the forecast period. Praxair Surface Technologies, Inc. acquired packaged gas businesses in North and South America and obtained controlling interest of an equity investment in Asia, which amounted to US$ 82Mn in 2015. The company had acquisition totaling US$ 206 Mn in 2014. Thermal Spraying Technologies developed thermal sprayed coating solutions for some of the leading global manufacturers and expanded its facility in Sun Prairie, Wisconsin, the U.S. in 2014. Expansion of facilities helped the company increase workforce, thus allowing it to cater to the increasing demand for thermal barrier coatings from consumers. Thermal barrier coatings are used in the form of product such as metal, intermetallic, ceramic, and others. The thermal barrier coating is composed of two layers. Metallic coatings are above 0.004 inches in thickness. Metallic coatings are deposited by vapor deposition technology. Intermetallic alloys are obtained by fusing high-purity metallic elements in stoichiometric ratios for Fe3Al and FeAl compounds. Ceramic is a thin film coating which is used to protect parts of various machines to increase their lifespan by reducing maintenance and downtime. Other coatings include rare earth zirconates and rare earth oxides. Rare earth oxides have low thermal conductivity and high thermal expansion; therefore, these are used as thermal barrier coatings in various applications. Based on technology, the thermal barrier coatings market has been categorized into vapor deposition, high-velocity oxygen fuel (HVOF), and air plasma. The vapor deposition segment holds a major share in thermal barrier coatings market. Based on coating material, the thermal barrier coatings market has been divided into aluminum oxide, ceramic Yttria-stabilized zirconia (YSZ), MCrAlY, and others. Aluminum oxide is stable in a chemical environment and is an oxygen barrier. It is observed that the use of aluminum oxide than the YSZ coating decreases oxygen diffusivity and salt penetration. Ceramic YSZ coatings are widely used in turbine engines to protect the metal structure from the heat of combusted jet fuel. Ceramic YSZ coatings are also used in all new aircrafts. MCrAlY coatings are widely used as first and second coatings to prevent corrosion of turbine blades and nozzle guide vanes. In terms of application, the thermal barrier coatings market has been segregated into industrial, automotive, aerospace, and energy. The industrial segment holds a dominant share of the market. Automotive is an attractive segment of the market. Based on region, the global thermal barrier coatings market has been divided into North America, Europe, Asia Pacific, Middle East & Africa, and Latin America. North America and Europe are key regions of the thermal barrier coatings market. In terms of consumption, Asia Pacific holds a major share of the global thermal barrier coatings market. High demand for these coatings from the automotive sector boosts the market in the region. The thermal barrier coatings market in India and China is anticipated to expand at a rapid pace during the forecast period due to the rise in industrialization and growth in automotive and aerospace industries in these countries. China is a major consumer of thermal barrier coatings in Asia Pacific. Middle East & Africa is an emerging region for the thermal barrier coatings market. Expansion of the market in this region can be attributed to high demand for these coatings and high availability of fuel for the industries such as automotive and aerospace. 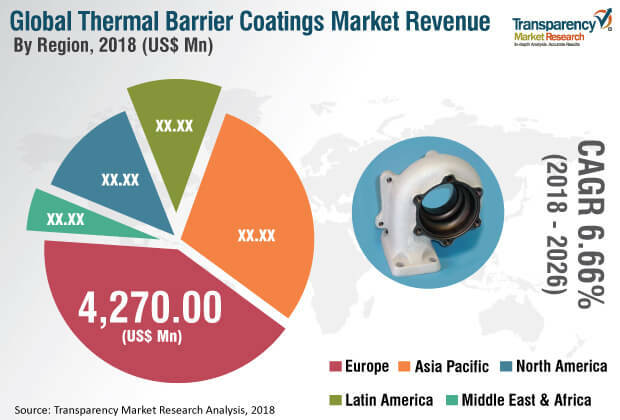 Key players operating in the global thermal barrier coatings market include A&A Thermal Spray Coatings, Praxair, Inc., H.C. Starck GmBH, ASB Industries, Inc., Air Products and Chemicals, Inc. Flame Spray Coating Co., THERMION, Metallisation Ltd., Metallizing Equipment Co. Pvt. Ltd., and The Fisher Barton Group. This report analyzes and forecasts the market for thermal barrier coatings at the global and regional level. The market has been forecasted based on value (US$ Mn) from 2018 to 2026. The study includes drivers and restraints of the global thermal barrier coatings market. It also covers the impact of these drivers and restraints on the demand for thermal barrier coatings during the forecast period. The report also highlights opportunities in the thermal barrier coatings market on the global level. The report comprises a detailed value chain analysis, which provides a comprehensive view of the global thermal barrier coatings market. The Porter’s Five Forces model for the thermal barrier coatings market has also been included to help understand the competitive landscape in the market. The study encompasses market attractiveness analysis, wherein applications are benchmarked based on their market size, growth rate, and general attractiveness. The study provides a decisive view of the global thermal barrier coatings market by segmenting it in terms of product, technology, coating material, and application. The segments have been analyzed based on present and future trends. Regional segmentation includes the current and projected demand for thermal barrier coatings in North America, Europe, Asia Pacific, Latin America, and Middle East & Africa. The report also covers the demand for individual product, technology, coating material, and application segments in all regions. Key players operating in the thermal barrier coatings market include A&A Thermal Spray Coatings, Praxair, Inc., H.C. Starck GmBH, ASB Industries, Inc., Air Products and Chemicals, Inc. Flame Spray Coating Co., THERMION, Metallisation Ltd., Metallizing Equipment Co. Pvt. Ltd., and The Fisher Barton Group. Market players have been profiled in terms of company overview, financial overview, business strategies, and recent developments. The report provides the estimated market size of thermal barrier coatings for 2017 and forecast for the next nine years. The size of the global thermal barrier coatings market has been provided in terms of value. Market numbers have been estimated based on product, technology, coating material, and application of thermal barrier coatings. Market size and forecast for each major product, technology, coating material, and application have been provided in terms of the global and regional market. We conducted in-depth interviews and discussions with a number of key industry participants and opinion leaders to compile this research report. Primary research represents the bulk of research efforts, supplemented by extensive secondary research. We reviewed key players operating in various end-use industries, annual reports, press releases, and relevant documents for competitive analysis and market understanding. Secondary research also includes a search of recent trade, technical writing, internet sources, and statistical data from government websites, trade associations, and agencies. These have proven to be a reliable, effective, and successful approach for obtaining precise market data, capturing industry participants’ insights, and recognizing business opportunities.